As we wrap up 2016 with the fond and unforgettable memories of this year’s events, we couldn’t be more thrilled for the new adventures to come. Our roster for 2017 is filled with exciting new adventures we have planned just for you. From Cuba to St. Petersburg, Budapest to Mackinac Island, Santa Fe to London and Scotland, there’s plenty here to fill your bucket list. In fact, we’re calling 2017 our ultimate bucket list year, and we can’t wait to share even more countless unique experiences with you, our loyal Members. So get your calendars ready as you read this issue of The Panorama. Each event has been designed with care to ensure that you have the opportunity to discover cutting-edge investment strategies from our team of world-renowned investment experts… connect with like-minded Members who share your passion for travel and investing… and explore the world’s most beloved destinations in ways that only the most fortunate travelers can. We guarantee your experience will be exciting, inspiring and truly unforgettable. This past September, we had the one-of-a-kind opportunity to travel with a close group of Members on The Oxford Club’s 2016 Financial Discovery Tour of South Africa. The journey began in Johannesburg, where the group gathered at the historic Rand Club and was later treated to a Members-only cocktail reception. We then visited the town of Soweto, making a stop at the former home of Nelson Mandela, and had an exclusive tour of the Kimberley Mine, where we viewed some of the largest diamonds in the world. From there, attendees boarded six-seater bush planes to the &Ngala Safari Lodge bordering Kruger National Park, where we saw everything from baboons and lions to a leopard with its freshly caught prey… and enjoyed everything the safari had to offer. Our group was then treated to a day and a half aboard the lavish Blue Train, where we journeyed “old world” style to our final destination of Cape Town. During our stay in Cape Town, we enjoyed a splendid wine and chocolate pairing at the Lanzerac Wine Estate and enjoyed the breathtaking mountain views during our private dinner at the Delaire Graff Estate. Although there was plenty of gold, wine, diamonds and lions for our enjoyment, attendees were also treated to recommendations from Beyond the Dollar Co-Founder Karim Rahemtulla’s presentation “How to Position Yourself for the Dollar’s Ultimate Decline.” They were also treated to presentations by our special guest speakers, including Gavin Lapedus, dealer at Prodiam Trading; Michael Checkan, chairman and CEO of Asset Strategies International; Derryn Maade, analyst at HSBC Bank; and Lance Greyling, director of trade and investment for the Office of the Executive Mayor of Cape Town. It was a trip our Members will be talking about for years to come. “My wanderlust has led me around the world many times over. 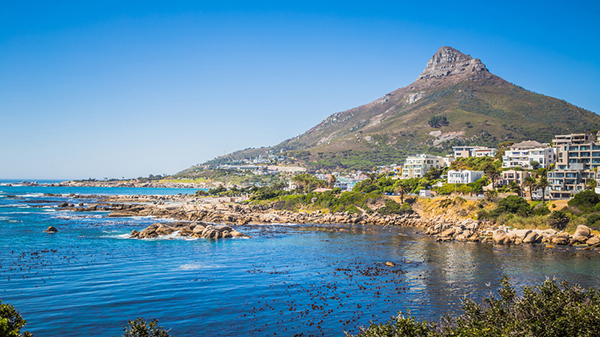 But there was one place I always wanted to see but had no good reason to visit… until recently: Cape Town, South Africa. “A couple weeks ago, I was there, sitting at the Two Oceans Restaurant, sipping a double vodka with a splash of cranberry and scanning the horizon. I could see in the distance, not more than a mile from where I sat, the southernmost point of Africa. 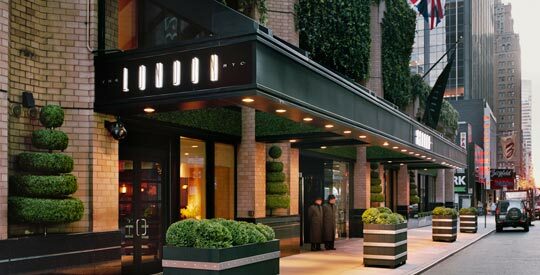 This fall, we closed out the 2016 events season with a successful Investing in Fine Art & Rare Tangible Assets Seminar, which took place at the posh London NYC hotel in New York City. Hosted by CEO and Executive Director Julia Guth and Chief Investment Strategist Alexander Green, this event was designed to bring together world premier experts from the various sectors of the tangible assets and fine arts markets and to discuss these somewhat underexplored sectors, which have proven to outperform the S&P over the last 10 years and counting. 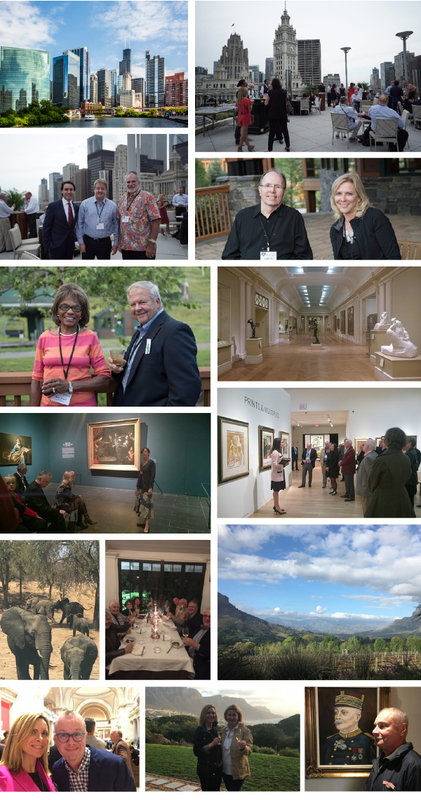 And thanks to our exclusive connection with esteemed art and collectibles experts from New York, Washington, D.C. and London, our group of Members had the rare opportunity to meet, drink and dine with leading experts on art investing from around the world. At the close of the first day, the group gathered at Sotheby’s, where they enjoyed a private tour followed by a lively cocktail reception. The second day of the seminar was no less exciting, with presentations on the best ways to profit on rare tangible assets, the “fine art of fine art investing,” and how to invest in wine and ancient coins. Clive Moss, rare book expert for Dreweatts & Bloomsbury Auctions, focused on collecting rare books and modern first editions for both pleasure and profit. You can view Clive’s insightful presentation here. Now that Trump has been elected, what’s next for investors? With all the talk of taxes, rates, the direction of big corporations and much more, we’re all eager to find out where the economy is headed next with Trump’s presidency… And there’s no denying it will affect you one way or another. So we’d like to help you. Our goal at the Club’s Private Wealth Seminars is to make sure that you have the knowledge and preparation you need and that you find opportunities to profit. We understand you have a busy schedule, but this is information you shouldn’t miss out on. We’re giving you the option as to when and where you’d like to join us! 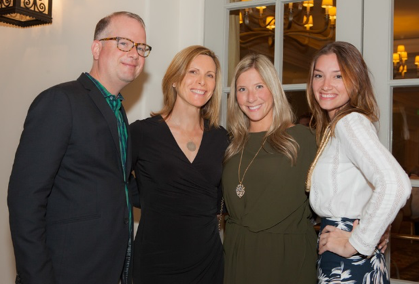 Oxford Club Event Director Steven King feels his job is to fulfill Members’ bucket lists – and that’s exactly what he did. It’s unlikely that you’ve never heard of The Grand Hotel, or even Mackinac Island before, as they are true American staples. Dubbed America’s “summer palace,” this location for our summer Private Wealth Seminar is the ideal getaway in every way. Once you step foot onto the island, you are immediately taken back in time – and we mean it. Accessible only by ferry or seaplane, Mackinac Island takes old-fashioned to a new level. With just one motorized vehicle used only for emergencies, the only way to get around is by foot, bike or horse-drawn carriage. This is all the more reason to explore the island’s charming town. Aside from its tranquility and history, both the island and resort offer endless activities. From golfing to swimming to sailing, there’s something for everyone. For more details, please contact voyagerclub@oxfordclub.com. Since we have bucket list destinations on our minds for 2017, we are returning to the Southwest for the first time in 10 years – and you’ll soon see why. 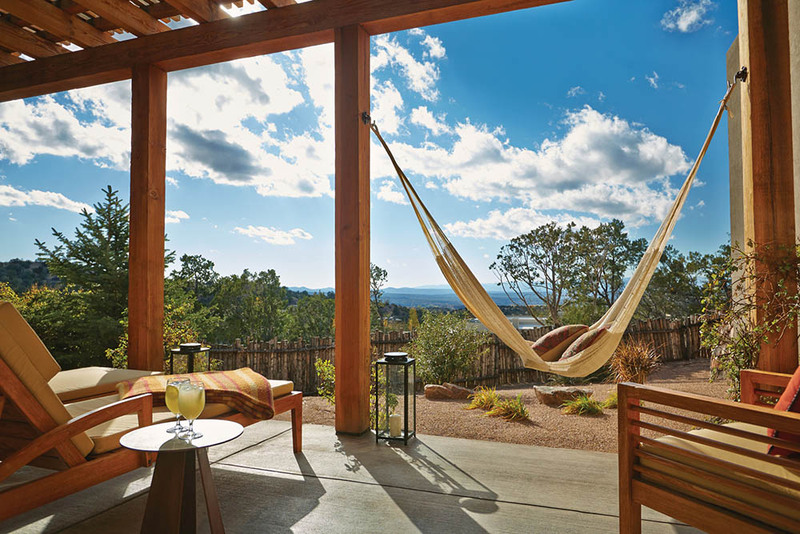 Our friends at the Four Seasons have surpassed travelers’ expectations with their Rancho Encantado Resort in Santa Fe. Once named “Rancho de los Soñadores” (Ranch of the Dreamers), this location has a deep history. It’s gone from dude ranch to ranch-style resort that has a history of housing Prince Rainier and Princess Grace of Monaco, the Dalai Lama, Princess Anne, John Wayne and many others. What is known today as Rancho Encantado captures the true spirit of Santa Fe and its rich culture. The property itself is broken up into several main lodges and houses just 65 plush “casita” style guest rooms, making it an intimate setting. Aside from the property, Santa Fe has plenty to offer visitors, including New Mexico’s own seven wonders of the world – which you can view from a hot air balloon. Don’t miss out on the opportunity to discover the frontier in five-star luxury. For more details, contact voyagerclub@oxfordclub.com. Spring means one thing for our World Financial Seminars team – time for our Annual Investment U Conference. And for this premier event, we spare no expense to bring you the latest and greatest from the investing world. Over the past 18 years, we have witnessed the ideas shared at this event turn into colossal profit opportunities – and now you can too. In fact, at our 2016 event, attendees had the chance to score huge double-and triple-digit gains on 42 of the recommendations presented, including 10.47% on Reynolds American and 167.83% on Avino Silver & Gold Mines Ltd.
And not only in 2016… but year after year, attendees could have scored gains as high as 303% on Wynn Resorts, 155% on E-House (China) Holdings, 275% on Tiffany, 103% on Cerner Corp. and 129% on Millicom International. Here’s the best part… This past year brought one big idea to our experts – “What’s Next for the American Dream” – and with recent market conditions in mind, our editors are hard at work preparing to share their strongest strategies to help you profit through the next economic boom and bust cycle. 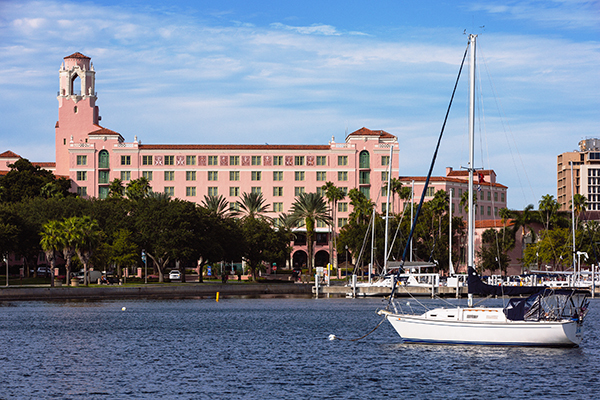 They’ll reveal all of their research and moneymaking recommendations only at our 19th Annual Investment U Conference at the Vinoy Renaissance in St. Petersburg, Florida, this coming March 15-18. Altogether, you will have the chance to hear from more than two dozen experts, including our team and several noted guest speakers, including Karim Rahemtulla, Co-Founder of Beyond the Dollar; Rick Rule, president and CEO of Sprott U.S. Holdings; and Frank Holmes, CEO and chief investment officer of U.S. Global investors. And, back by popular demand, John Hofmeister, former president of Shell Oil Company, will also be joining our well-known panel of experts. His presentation was such a hit at last year’s conference, we’re thrilled to welcome him back. We’re confident our 19th Annual Investment U Conference will be the best one yet, and we look forward to exceeding your expectations during this closed-door affair. For all the details, simply click here now. Hurry – only six cabins remain! Over the last 10 years, some of our most coveted events have been our Chairman’s Circle Wealth Cruises aboard the luxurious Crystal Symphony. One of our favorite parts of attending these events is hearing from our Members about where they’d like to go next. By far, the most popular request has been for The Oxford Club to host a river cruise. And if I may say so myself, we’ve really outdone ourselves this time. In record time, we have filled more than half the spots in the first two weeks, and now we invite you to take advantage of one of our last spots on this incredible adventure. Join us on our very first river cruise for our Annual Beyond Wealth retreat. From May 21 to May 28, you will have the opportunity to board the famous Uniworld S.S. Maria Theresa for an all-inclusive journey beginning in Budapest, Hungary, and ending in Passau, Germany. Explore Slovakia’s capital city of Bratislava, which features a village-like atmosphere and a fascinating mosaic of architectural styles. Attend an exclusive “Royal Anniversary” Mozart and Strauss concert at a Viennese palace. Visit Mozart’s childhood home and the garden where the famous “do-re-mi” scene from The Sound of Music was filmed. And we’ve just added a pre-seminar event at the Corinthia Hotel in Budapest to take place the morning before you board the ship. We’ve invited three Hungarian economic and financial experts to give you firsthand insight into the Eastern European markets. Following the seminar, the group will gather and board the S.S. Maria Theresa. On this trip, you will have the opportunity to hear from your favorite Oxford Club editors, including Alex Green, Marc Lichtenfeld and Steve McDonald, as well as guest speaker Adriane Berg. All of them will discuss crucial topics such as finding the most effective strategies for investing in today’s challenging markets and discovering the best ways to enrich your life – as well as your portfolio – so you can ultimately live beyond wealth. Talk about the trip of a lifetime. See all the details here. Recently, Editor of Beyond the Dollar, Karim Rahmetulla had the chance to not only sit down, but also travel with renowned travel and lifestyle expert Fritz Satran. Born and raised in Vienna, Fritz founded AESU Travel in 1977 on the idea of increasing global understanding through travel. Over the years, Fritz and his staff have conducted high-end tours to Europe for many prestigious groups and universities, including the Johns Hopkins University trustees, the Baltimore Opera and The Oxford Club (a friend of Beyond the Dollar). Driven by a belief in the idea of travel with a purpose, Fritz specializes in creating unique and flawlessly executed travel experiences. Karim: Fritz, you’ve lived overseas and traveled for decades. Recently I accompanied you on an excellent trip to South Africa. We spoke at length about your time spent in Greece. You have a unique perspective, living in Maryland today, about the challenges and benefits of living abroad. Can you share some of those with us? Fritz: Living abroad for periods of time lets you experience life from a totally different perspective. All you need to do is stick around one place long enough to become part of a new way of life. Learn the language and the local customs. The result: You live twice! The challenge is it takes time, effort and focus to grow roots somewhere new. If you ever thought of having a “Plan B,” establishing a second place to live in another part of the world would be a good start. Do it, and it will change your life! Karim: As the owner of a major travel agency, you have to constantly deal with currency fluctuations that can result in transactions measured in the hundreds of thousands of dollars, euros and pounds. What types of instruments do you use to manage risk? Fritz: Predicting the economic and political future is surely a challenge! This is especially true in a world dominated by algorithms, computers and people depending on their smartphones for real-time information. Forward contracts to lock in favorable exchange rates are helpful but, more than anything else, 40 years of experience in dealing with a particular type of business, human intuition, and good old gut feelings make all the difference! Oh yes, and let’s not forget luck! Karim: In our conversations, your favorite observation seems to be “rent, don’t buy” when looking abroad. Can you explain your thinking? Fritz: I could write a book about what it means to buy in a foreign country. Just a few considerations: learning the languages and educating yourself about local laws, rules and regulations, customs, etc. The list is long. In short, it’s like this: When you put your money into foreign property, you are a stranger, a target and a challenge to the locals – some sort of enemy! If you rent, people will see you as a customer who brings money and opportunity. They will want to be your friend! Karim: You’ve stayed at some of the best hotels in the world and eaten at some of the highest-rated restaurants. Which ones stand out to you the most? HÃ´tel Le Cep – Beaune, France. Harry Cipriani – New York City, United States. Karim: You have arranged exclusive trips for The Oxford Club for almost three decades. Who do you think is best suited to take these awesome adventures with you? Are there limitations? Fritz: Anyone who feels the “lust for life” and who loves to travel and share the experience with like-minded people, while doing it in a very civilized style, should not miss any of these wonderful travel opportunities. Dreams have no limitations! Karim: The world is becoming smaller. It’s hard to tell the difference between some places even after an eight-hour flight. If you were to choose a part of the world that you would consider moving to, where the cost of living is lower while the standard of living is higher than in the United States, where would that be? Fritz: Two places come to mind here. One would be Austria, a small Alpine paradise in the heart of Europe. It has a population of 8 million, minimal poverty, little crime, and excellent public services and infrastructure. Mountains, lakes, friendly people, a cuisine to fall in love with… schnitzel… For eight years in a row, Vienna has been rated as the city with the highest standard of living in the world! Karim: You’ve witnessed the decline of living standards in the United States as the dollar has declined in value over the years. What advice would you give, as a purveyor of leisure, to the readers of Beyond the Dollar? Would you recommend spending dollars today on travel and leisure abroad, or do you think things are going to be an even better value in the years ahead?